One of my regular rituals for the past several months is to listen to bits of the podcast of the Alex Jones show. The guy is no saint and he rants a lot. I have criticized him in earlier blogs for a lack of decorum but generally I find what he presents to be spot on and he has many followers. He covers stuff and provides opinions and insights I don’t see in British mainstream media and it serves as a much needed corrective. There is usually a small delay when I type “Alex Jones” on the YouTube search line, which invariably when I do comes up with a page of anti-Alex hits (another story), but I get there in the end when I refine the search. But not earlier this week when I found out he had been banned off this and other platforms. Also early in the week, a rumpus was caused when Boris Johnson wrote a newspaper article criticizing the wearing of the Burka. All sorts of people have weighed in with an opinion (for and against) with the normal suspects demanding Boris being censored or worse. I have waded in with my view that his views on the wearing (or not) of the burka were essentially correct and that he should be allowed to express them (especially as he holds no government office that could compromise his position) but that the language and imagery he used was intemperate and unwise. I suspect he is counting on saying what many feel but are afraid of giving vent to. It begs the question (as with Jones) when should expressing an unpopular opinion be allowed and under what circumstances, especially if doing so could (overtly or otherwise) incite others to hatred? It is no coincidence both Alex and Boris are seen as on the right politically. I have no doubt that words do have an affect (good or bad) but the effects of shutting down free speech could be even worse. I recently wrote an article titled “Shadow banning, free press and free speech” giving my views on the subject, and then soon after the Alex and Boris stories broke, which appeared to me to be strangely relevant. I should say that when it comes to inciting hatred (and in the cases of Alex and Boris I do not believed this happened intentionally, although both should have been aware) it happens with left toward the right and right toward the left. Indelibly printed on my mind is the congressional baseball shooting that took place a year ago. A number of republican congressmen were shot at by a lone left wing activist who had been spurred on, at least partially, by an assortment of media outlets putting out unchecked anti-Trump statements, on a variety of platforms. Then there are conservative types that attend rallies to do with their causes attacked by the likes of Antifa. One of my feeds this week was a critique of the New York Times who run an unpleasant hit piece on Vice President Mike Pence and were able to get away with it uncensored. My point is people are making offensive and false statements from the left as well as the right and these have consequences, yet as far as I can make out are not brought to task by the Internet gatekeepers. I quite got it when a Facebook friend posted me a link today “Alex Jones repeatedly threatened people with violence” that this is what Alex is often seen to be doing. However, it was a collection of clips of him in his customary rant mode, with little context given, especially as in some of these cases he was responding to threats against himself. One of the complaints against Alex concerns the Sandy Hook gun shootings and it seemed to me that he had been largely misrepresented as saying the massacre did not take place (which it did and he acknowledged while at the same time questioning the official version). I am not saying he could have handled the matter with greater sensitivity, but it seems to me he has been too often the victim of people who choose to ignore the ninth commandment because what Alex says as he denounces the people who he sees as harmful and regards as scum and the shenanigans in society is too close to the truth for comfort. It seems that not only has Alex been thrown off Google and Facebook (although not Twitter despite remonstrations by the likes of his nemesis: the New York Times and CNN) but several other platforms in a short space of time (surely no coincidence). While they try to claim the moral high ground by claiming Alex had violated the rules and had been given prior warning, I am far from convinced and have not seen specific examples. It seemed they are generally going after conservative (right) voices and fail to call out liberal (left) ones. The worry is this is tantamount to racketeering and the fact they are private organizations that can do what they wish is unconvincing because between them they control the Internet and have inordinate power to ruin businesses who do not toe the line. One also wonders if there is a political motivation, for after all the crucial mid term elections are only three months away and few would disagree that these gatekeepers to the Internet would prefer Democrat to Trump, and one of the media outlets that has been supportive of Trump is Alex Jones. I can’t help add another reason for supporting Trump – it would have been worse under Hillary (one member of the proverbial swamp Alex chose to target)! As I have often reflected, the shutting down of free thought and expression is these days an ever increasing actuality, not just in totalitarian societies (who incidentally are in cahoots with the likes of Facebook and Apple to tighten their grip on dissenters) but also in the so-called free west. 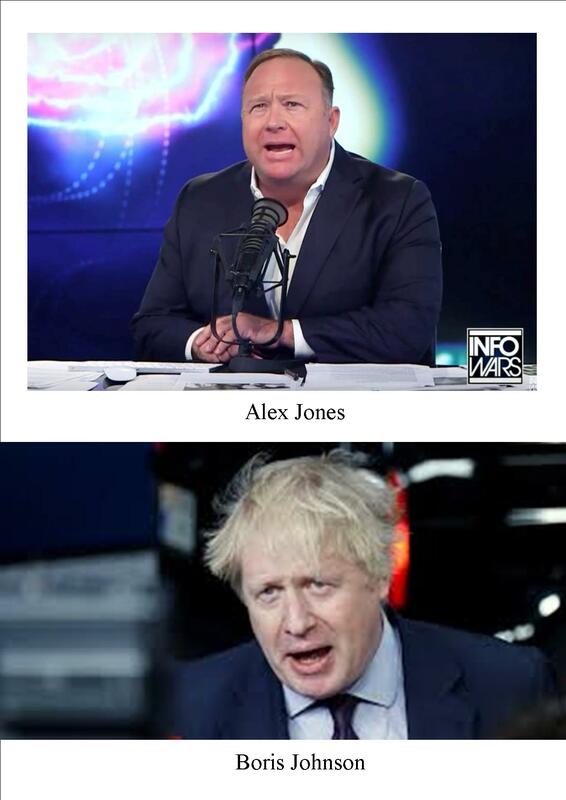 Things are not what they seem and it takes an Alex Jones and a Boris Johnson to remind us that is the case. I sense we are seeing now the tip of the iceberg, and after throwing Alex (and Boris) under the bus (or at least trying to), who next? After purging conservative types and those who don’t subscribe the official narrative, it could well end with removing Trump and the eventual wiping out of dissent and the subjugation of humankind. When a friend of mine said what is happening is not a big deal compared with a plethora of justice and poverty issues around us, I begged to differ. People need to know the truth and it is the truth that will set us free. There are some who read this who would be glad to be rid of Alex and Boris but I doubt it will happen that easily. Whatever my view of the two men, and I do not give either a free pass, I am more concerned about the issues that they raise and hope the truth will come out and humanity will be set free as a result. ← Why is Trump so divisive?